Therefore if you have any encouragement from being united with Christ, if any comfort from his love, if any common sharing in the Spirit,if any tenderness and compassion, then make my joy complete by being like-minded, having the same love, being one in spirit and of one mind. Do nothing out of selfish ambition or vain conceit. Rather, in humility value others above yourselves, not looking to your own interests but each of you to the interests of the others. What beautiful advice for all of us. Regard others as better than yourselves. Do nothing from selfish ambition or conceit. Look not to your own interests, but to the interests of others. Let us reflect on that a little bit. What great advice. I think this is what we are supposed to live with. If we keep this advice, the world we live in will become a better place. Obama in his speech for the nuclear negotiation with Iran said, “At the end, the world will be a safer place, safer world, the better world.” That’s what we want. If we take Paul’s advice seriously, I think many of our relationships will become quite better. We know we live in a fragmented world, relationships shattered and broken, and I realized that we did not keep Jesus’ advice or Paul’s advice. We are tremendously influenced by the world unconsciously, without ever realizing how much we are controlled by the ethos and the thinking of the world. As Joshua shared, working 12, 15 hours a day, do you really think about what you are living for? We are very much influenced and have to understand how much are we are influenced by the world. We can’t just let the world influence us. I think the world we live in is controlled by the power, everything is based on power. What is power? I don’t think that it’s just political power. For example, how rich you are, how popular you are, how well educated you are, how well you’re doing with your career, how attractive you are, what race you are or what gender you are. All of these things make up personal power. We live based on the power that we have accumulated for ourselves, and from there we try to build relationships with others with the power that we have. That’s why sometimes, you try to accumulate this power so that you can have the upper hand in your relationship. Then you look down upon those who are less powerful and you’re very nice to those as powerful or more powerful than you. You know my friends intrinsically, power has a desire to control and even control our relationships. We are so deeply entrenched in the power-hungry world that we do that with each other too. Even among couples, they constantly have power struggles between each other. Even with friends there is power struggle. People who are enslaved by the power try to put others under you, under your control, and they don’t even realize they are doing it. They have this automatic assumption that “I’m better than you” or “I should be better than you”. No matter what, I’m better than you. They are not even aware of this assumption. Whether you’re a religious person, or even in other areas, people use that. Even in religion, they use that to gain the upper hand. “I’m better than you, at least in my faith, in my spirituality”, from that all kinds of prejudice begins: racism, sexism, ageism, classism, elitism, you name it. No matter how worthless a person may look, if we cannot uphold that person’s human dignity, I think that’s corruption. That’s corrupted thinking. No matter how shabby and how pathetic this person may look, if you cannot uphold that person’s human dignity, you have already corrupted your thinking. Whether that person is a strong person, weak person, a waitress in a restaurant, or students in the airplane, no matter who they are, they all deserve your respect and human dignity . Saint Paul said to “Regard others as better than yourselves”. I think that’s a remedy. This is so against the culture stream, culture trend in our society. I want to be better than you always. I worked so hard so that I can be better than you, but Paul said “Regard others as better than yourself”. That is so against the stream of our modern thinking, but I think that’s the wisdom. I believe that’s the truth, and I think that it is something that we need to hold onto. How can we regard others better than yourselves? It is hard to do because whenever we tried to do that, we felt miserable. When you consider other people better than you, you feel miserable. Is Paul telling us to live with this miserable feeling? I don’t think so. 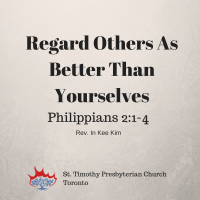 Paul is saying that even when you regard others better than yourself, you don’t need to feel miserable. That’s not what should make you feel miserable. It’s the way how you see things, the world and your relationship with others. When others do well, we have two contradicting feelings and emotions within us. On the one hand, we are very happy for them if their children are going to an Ivy school or if their children are doing a wonderful job and they are doing very well, you’re really happy for them. On the other hand, you wonder, what have I been doing all this time? They achieved so much and look at me, I have only done this. Right there, if you’re not careful, you fall into self-pity and you start feeling miserable. Let us consider a totally different scenario. Let’s say you feel that obviously you are better than the other person. You know, in terms of your singing ability, or in terms of your looks, or in terms of whatever, you obviously think that you’re better than the other person. How can I consider the other person better than myself? Do I fake it? Do I say “Oh, you’re better than me.”, do I fake it? Paul said, “In humility, consider others better than yourself”. Not in false humility. We all know false humility so well. We are fooled by false humility multiple times, to the point we’re not fooled by false humility anymore. So, regarding others as better than yourself is not about comparing yourself with others and seeing who is better, it is our attitude towards other people. It doesn’t matter who the other person is. We always, whether that person is a child, or poor and powerless, you always consider them as better than yourself. You put yourself under that person. What is that called? When you put yourself under other people? What is that called? Servant. Exactly. That’s what a serving mentality is all about. He says in the four verses you read from verse five, he said, have the same attitude as Jesus, and then he showed what Jesus said. Who thought he was in the form of God, did not regard equality with God as something to be exploited, but emptied himself, taking the form of a slave or servant, being born in human likeness and being found in human form. Paul boldly declares that Jesus took the form of a servant. I think that’s a radical statement. Our Lord, the son of God, took the form of a servant. As Jesus became a servant to save the world, to make the world a better place, Jesus asked us to be a servant. That is the way of the disciples. That is our journey. Our journey is not towards the power, to defeat and control the people. Our journey is a journey to the servanthood, where we put ourselves under others and serve them. That’s what our journey is all about. We are not the people. We are Christians. We are not the people to rule, but, to serve. This is our philosophy. This is our principle of living. This is what Jesus said, “You know that among the gentiles, those whom they recognized as their rulers lorded over them and their great ones are tyrants over them, but it is not so, among you, but whoever wishes to become great among you, you must be a servant. And whoever wishes to be first among you must be the slave of all. For the son of man came not to be served, but to serve, and to give his life, a ransom for many”. My friends. This is a core of the gospel. There are many good things in the Bible, but that is a core of what we believe. Core of the Gospel. If you lose this core of the Gospel, you lose being a Christian. If we lose this, we don’t know what it means to follow Jesus Christ. If you’re still trying to rule over other people and conquer other people, whether it’s personally, nationally, or globally, then what we are doing is not Christian living. That’s what’s going on in the world right now, so we have to sometimes go against the stream of this world. Don’t blindly follow what the world does, stand strong even though that is against the stream. People who think like that are corrupted in their thinking. They fell into the futile thinking and with futile thinking, you cannot do God’s work. My friends, regard others as better than yourselves. When you deal with other people, look at yourself. Do you have this automatic assumption showing that I’m better than you because I’m a man?, because I’m white?, because I’m more educated? Because I’m more powerful? Or because I’m richer? Do you automatically assume that you’re better than the other person? Catch it. Your influenced. You’re influenced by the world’s thinking. Without realizing it, have we become a slave to power? So many times we feel insecure because we don’t have enough power. Or, because we have so much power, we have become arrogant. Let us pray that we are not slaves or servants of power, but that we be servants of love. Let us pray that God fill us so that we may truly become servants of love to serve other people and God. Thanks MSN! I like the “reflection”, u should continue to have this after all the sermons. All the other ones didnt have this? I like it!